February is National Children’s Dental Health Month! This month is meant to raise awareness about the importance of children’s oral health. It is imperative to instill good brushing and flossing habits from an early age. However, despite the fact that it is almost completely preventable, tooth decay is one of the most chronic diseases affecting children. And, what’s more, reports show that American students miss 51 million hours of school every year because of oral health issues. But, this month, and every month forward we can all start making a difference. Here are some tips to get kids excited about taking care of their teeth. While this may seem old-fashioned, nothing shows accomplishment more than actually physically seeing it displayed. Making a start-chart is a fun family craft to get everyone involved. Plus, it lets your youngster know that you all value good oral health. Make it exciting by creating accomplishment goals. Consider offering a prize once your child meets the objectives. Why not add a bit of toe-tapping fun to what may seem like a boring task? Have your child brush for the entire length of a song. You both can choose a favorite tune. Make sure it is around 2-3 minutes long. Check out a few fun books from the library that feature characters taking care of their teeth. Or download fun videos where your children’s favorite characters are promoting brushing. Consider purchasing toothbrushes and accessories with these beloved characters to reinforce the concept. PS… this could be one of the aforementioned star-chart prizes! Children learn by example. If they see you eating healthy, they will eat healthy too. Encourage the habits by letting them know, not only will their bodies grow up to be big, strong, and healthy, but so will their teeth! 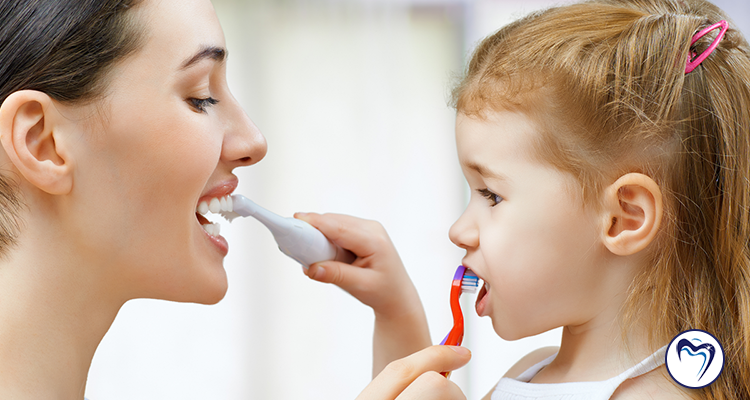 Regular dental visits should be a part of growing up, just as any other routine. As stated before, oral health is directly related to overall health. From the time your child’s first teeth erupt you need to keep them clean. Tooth decay is preventable. Your child may visit the dentist as early as one year old. That way, she or he gets comfortable with the process from an early age. Denise Dental believes in the importance of reaching out to our community. We understand that if we all work together, we can make a change. Every year, during Children’s Dental Health Month we spend time offering services to those who may not have access to regular dental care. If you have any questions regarding your child’s oral health, or to learn how you can help with community outreach, contact our studio today.